Game accessory, companion or confidant, the puppet is the simple and fun way for children to communicate their deep thoughts. Fun and fright guaranteed with this phantom puppet of circumstance on the eve of Halloween . Take a sheet of newspaper and make a ball about 6-7 cm in diameter. Spread the white fabric and cut a large square about 50 x 50 cm. Place the paper ball in the center of the fabric square and enclose it in it. Close with a white cotton thread, knot. Follow the instructions to easily perform a bowling game, with three times nothing. 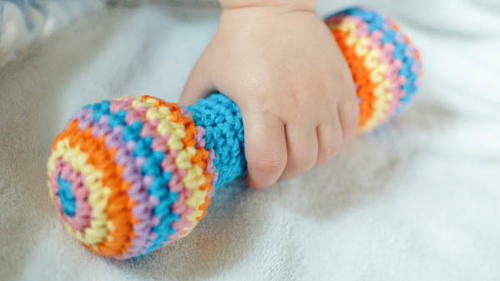 Your child can lend you a hand and then have fun with this skill game. Remove the labels from the six milk bottles. 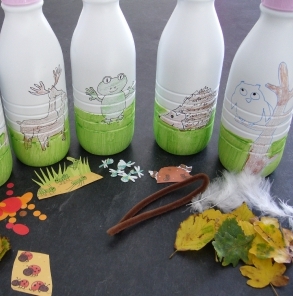 With the fine point marker, draw on each bottle animals, characters or any pattern. Here: a snail, a hedgehog, a frog, three mushrooms, an owl, a doe and a deer. Color the patterns with the felt.